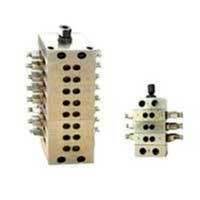 We hold substantial expertise in making available high quality Progressive Blocks. Our array of Progressive Blocks is available in various models such as Progressive Blocks (45X55) and Progressive Blocks (60X80). Appreciated for their high efficiency in lubricating various machinery and equipment, our Progressive Blocks are in great demand. The clients can avail these Progressive Blocks at very nominal price. Established as a Sole Proprietorship (Individual) based company in the year 2003 at Faridabad (Haryana, India), we, “Fine Drop Multilub”, are engaged in manufacturing and supplying a wide range of Industrial Pump, Pneumatic Grease Oil Pump, Metering Cartridge, Rotary Gear Pump, Multi Point Radial Lubricator System, Oil Circulation System, etc. These products are broadly acknowledged for their features like corrosion resistance body, light weight, strong design, high strength and high durability. By our dexterous professionals, these products are manufactured using quality proven material that is procured from well known sources. Prior to their dispatch, all our products are inspected by our skilled quality managers on well-defined parameters. In order to serve a wide range of industries, we provide these products in numerous specifications. Besides, clients can purchase these products from us at feasible prices.